While business owners agree to the growing importance of content marketing, only few of them are aware of the fact that globalization of content is equally crucial for success of their businesses. You need to design and market your content for the global audience, in varied languages and cultures to win their hearts. The importance of delivering and marketing your content in local languages is evident from a recent survey. According to a survey conducted by Common Sense Advisory, 72.1% of consumers like to spend most of their time on websites that have their native languages and almost equal percentage of consumers buy products from such websites. The survey further found out that 56.2% consumers thought that getting information in their own language is much more important than price. For smart businesses, these stats serve as the last warning to mould their content according to the customers coming from different local cultures and language backgrounds. The first and the most important thing here is to make sure that your knowledge of your global audience is profound. Since you will cater to different sets of audience, people you are not familiar with in terms of their culture and language, research extensively to create your piece of content. Carrying out a research of audience will help you in developing a content marketing plan dedicated specially to your local audience in a particular country. Remember that only 20% of all Internet users speak English as their mother tongue. To take your business to them, you analyze your competitors’ moves to address such an audience. Find out what methods have your competitors adopted for expansion of their brand amid different cultures and languages. You must try and create a separate website and URL in the language of your target audience. Alternatively, you can also settle for global gateway on your site. Also, decide how your audience will navigate. Make sure that the look of your new website is not much different from your main site. For instance, Hyatt.com is a global company that has opted for a global gateway and let’s its customers chose the language that are comfortable with in getting information. While you plan to take your content marketing strategy to the global stage, decide beforehand the vendor responsible for the program. For example, WeLocalize can be your choice to localize your content properly. WeLocalize is an expert vendor that helps you sort out issues that crop up regularly and they streamline the process instantly. Also, note that you will need several vendors for localizing your content in different languages. In case you address audiences with a wide range of preferred languages, we advise you to have an internal project manager who is able to take care of all the localized content marketing in a professional manner. One of the biggest issues related to content marketing secrets strategy for global audience is translation of content into different languages. You must find out a solution to this problem as it may also become expensive for your small business. If you are marketing your content such as whitepapers, be prepared for shelling out more from your pocket for translation. Clearly, you must have a team of professional translators as a part of your digital content strategy. It is natural for different people to have different likings and disliking about almost everything in life. Everyone have their own views and perspectives. So, there is no one size fits all in this case. You cannot apply the same branding rules on everyone out there in different countries. For example, a US company cannot brand it’s product in the same way in Brazilian market as it markets in it’s own country due to the cultural difference. Research well about the preferences of local people about design elements such as colors, fonts etc so that you do not offend their sensibilities. The key is to know more about your audience. Brands must also have information about local regulatory restrictions regarding use of images and labeling. Another useful tip for developing a content marketing strategy for global audience is to use all distribution channels. Avoid dependency only on Facebook and Twitter. Your global consumers have their own preferences for social channels. For instance, Sina Weibo is social channel that most Chinese use. In Netherlands, Hyves is a popular social channel. So, find out the social platforms mostly used in a particular country and distribute your content accordingly to reach out to a larger audience. If you are new to catering to the global audience, you must keep a close watch on the progress of your content marketing plan. You must be aware of the key performance indicators so that you can get the right signs on right time to make necessary improvements. It may be that a certain content marketing strategy works well with a certain audience but fails elsewhere. In that case, it would be a wise move to adopt a different approach by knowing the marketing needs of that local population. You must know about what works well with a set of population and formulate your content distribution strategy accordingly. 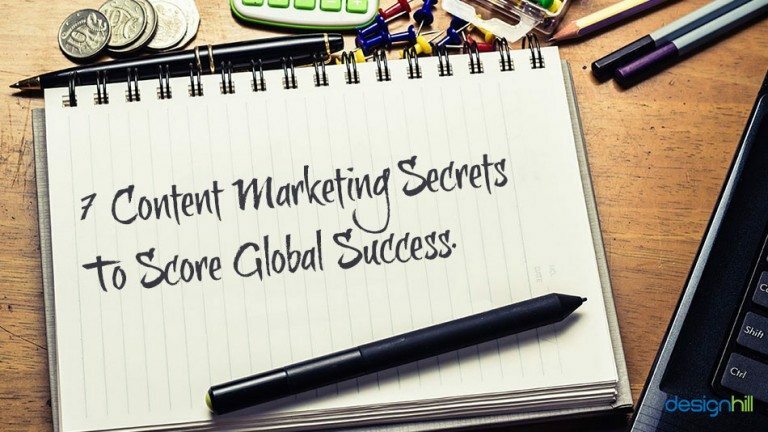 These tips are your secrets to achieving your goals when taking your content marketing secrets and plan to global audience. But make sure that prior to formulating your content marketing strategy, you have a website design that considers your local audience’s cultural and other aspects.